Bangalore, July 25, 2018: Students from Trio World School have made the school proud once again. Three students from the school, Ghaurav, Lalith and Chitraksh secured 1st ,2nd and 3rd position respectively in the 2nd Inter School Roller Skating Competition which was organized by The Foundation School, Gunjur, Bangalore recently. The event was held in 3 types – Tanacity, Quad & Inline. 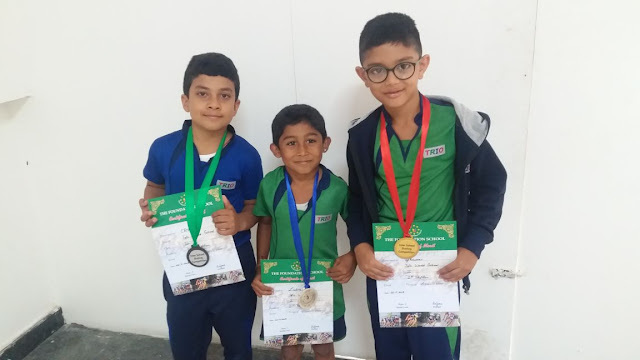 While Ghaurav and Lalith of Grade II won 1st & 2nd position respectively in Quad event, Chitraksh of Grade III secured 3rd position in tenacity event. More than 350 students from 15 schools across the city participated in this competition.